On twitter, an extremely large group of pet owners who are regular users formed a large community. 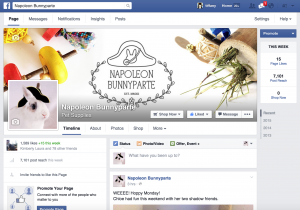 The Napoleon Bunnyparte brand tone was to be approachable and knowledgable, so a very conversational approach was taken for the usage of twitter. 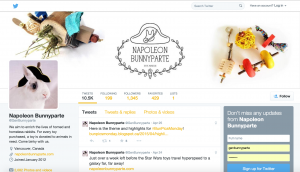 Photos of products, rabbits and direct tweets are used to address the audience personally. Contests are held with great response, and communications to affiliated organizations are publicly shown for further transparency into the business. This was the most experimental platform as the account is used from the first person perspective of a rabbit, Napoleon Bunnyparte. By creating a persona, the company became more approachable and open to communication. It also gave the flexibility to engage in conversations and present products casually. Sixteen months after this account’s creation, it is nearing 1400 followers and over 1500 tweets. 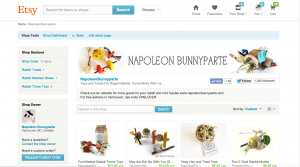 Etsy has a great community of users built into the platform, and this was leveraged to attract audiences to the handmade aspect of the products. Treasuries, groups, and conversations were used, and audiences were transferred from both Twitter and Etsy through tweeting products and connecting accounts. They key idea of leveraging this platform was to determine what users are on facebook for, what they are looking at, and when. Similarly to the YouTube and twitter platforms, it was determined that a mixture of product advertising and information must be presented in order to keep the audience’s attention. Photos, local events, as well as interesting facts are posted regularly, rather than products to reduce the feeling of being marketed to. This worked to keep the brand and products in mind, while engaging the users. Throughout different social media platforms such as YouTube and Instagram, it was crucial to maintain the same profile image and banner, as well as creating consistent lighting and compositional tones for imagery. It was important to maintain a similar voice across digital platforms to create a sense of unity to the brand. Abbreviations and contractions are avoided when possible, and communications are done through first person plural (us, we). In part, this originated from Twitter communications as part of a character persona ‘royal we’, but this also reflected the unified voice of the company.